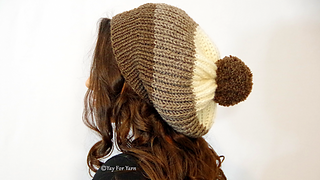 This Brioche Slouchy Hat is warm, squishy, and airy, knit in 3 colors. 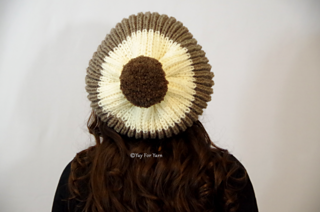 This tutorial will teach you to work my Shortcut Brioche stitch in the round. 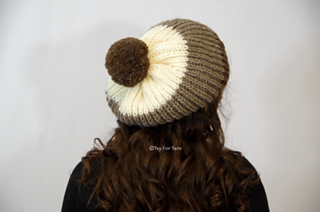 If you can work in the round and work “knit 1, purl 1” ribbing, you can knit this hat! There are no decreases at the crown, or anywhere in the pattern, it’s just ribbing and Shortcut Brioche Stitch. I added a large pom pom at the back. CLICK HERE to see the VIDEO TUTORIAL and free written pattern on my blog. 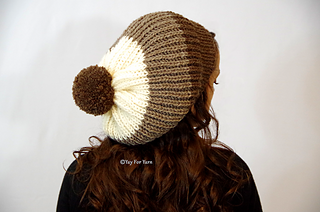 OR purchase the Large Print, Ad-Free, Printable PDF version of the pattern with the video tutorial by clicking the “Buy Now” button above. Get the pattern for the matching cowl here! With size 9 (5.5 mm) needles, working K1, P1 Ribbing, 20 stitches = 4” (10.2 cm) with fabric un-stretched. With size 10 (6.0 mm) needles, working Shortcut Brioche stitch, 13 stitches = 4” (10.2 cm) with fabric un-stretched. Size Small (For a Child) – Finished circumference of 17” (43.18 cm) un-stretched, fits head circumference of 18”-19” (45.72 cm – 48.26 cm). Size Medium (For a Teen or Smaller Adult Head) – Finished circumference of 19” (48.26 cm) un-stretched, fits head circumference of 20”- 21” (50.8 cm – 53.34 cm). Size Large (For a Larger Adult Head) – Finished circumference of 21” (53.34 cm) un-stretched, fits head circumference of 22” - 23” (55.88 cm – 58.42 cm).